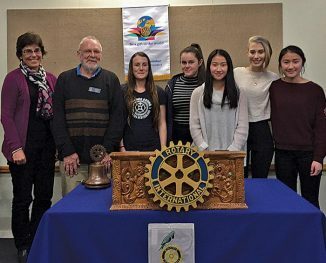 Rotarians really enjoy supporting young people to grow and develop, and we particularly enjoy hearing of their exploits and escapades on Rotary sponsored events. Thursday 20th August, Jess Pain from year 13 at Otaki College came and reported on her 21 days at Anikiwa on the Outward Bound program. She particularly enjoyed participating in the rowing, rock climbing, tramping, yachting, and was not fazed by spending 48 hours alone on an island, or three weeks without cell phone or facebook! Jess made many new friends, and thrived on extending herself in new directions. Jess made a wonderful colourful photo presentation to Rotary, a bit like a tourist brochure. The same night we had Tashayla, Petra, Jessica and Rebecca along, also year 13 Otaki College girls. They had all recently attended NZ Business week in Palmerston North, giving up a week of their holidays to upskill and network in the business world. Tashayla described the meeting and matching process, of young people from all over NZ, to form teams of 7 or 8 to compete as simulated business units. She said team was critical to surviving the assault course at Linton! Petra focussed on the many top business speakers that addressed the group, on topics like ethics, finding your passion, marketing, leadership, and teamwork. Rebecca spoke about the many business decisions the teams made during the week, and the fast and furious preparation for the final day fair. Jessica thanked Rotarians very much for the opportunity they had all had to learn and meet new people and ideas. Rotary are always keen to talk to young people that would like to attend growth and leadership events coming up.